Payment Analytics Software is the most important key of any organization to analyze the process of a huge amount of transactional data such as churn rate, transaction detail, dunning, refund, reporting and more. And we know that the growing demand and importance of payment analytics software in the market have spread worldwide as it is hard to analyze all your reports and transaction details without any software. So, it becomes really tough to shortlist the best & top payment analytic software for your business. That’s why here I am going to reveal 5+ top rated payment analytic software with which you can easily get the best tool to do advanced analysis of your business. Software should keep the record of the profit of your products & services sold, when will the corresponding credits arrive. Should be able to monitor the records of the transactions on the daily, monthly, and yearly basis. It should manage the high rejection rates like from where the rejection has happened, insufficient funds and more. And, the listed software in this article does the exact work which I have mentioned above that too at the lowest cost. All the payment analytics tools defined in this blog are user-friendly, performance-oriented and also some of them come with a free trial. 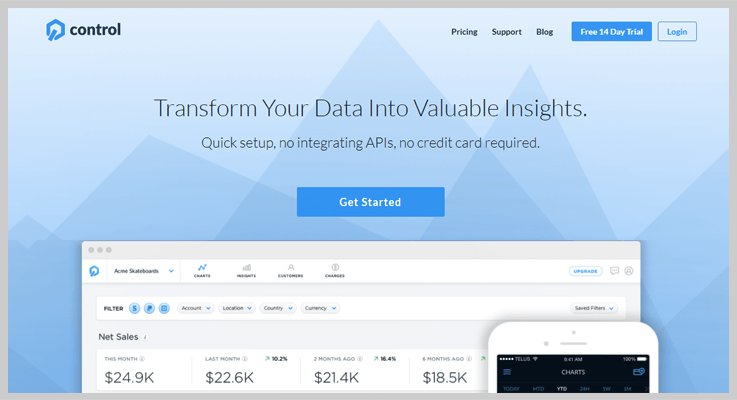 Stripe Analytics Software : Handle MRR, ARR, LTV & Churn rate with ease. Payment Tracking Software : Lifetime Payment Tracking @ $99. Pabbly Subscriptions is a one-stop solution to all the needs of payment & reports analytics. It has a clean coded dashboard where you can get an overview of all your products such as new subscriptions details, total sales or refunds, canceled subscriptions and so on. The software has assimilated all the useful features which we need on any payment analytics software. 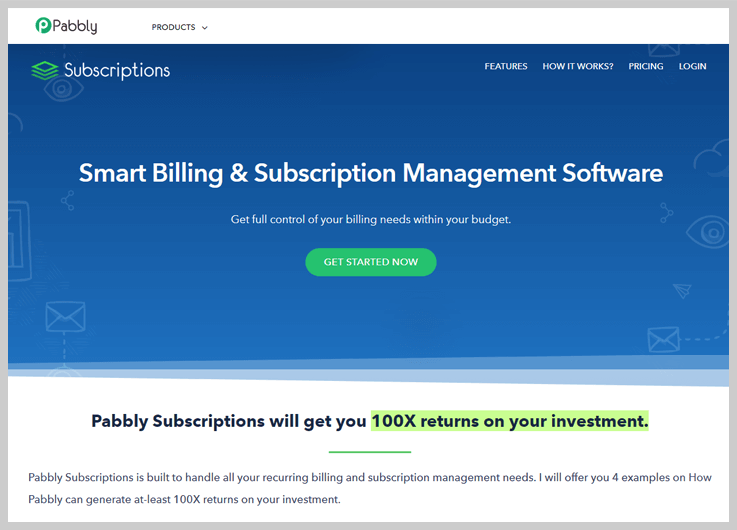 Along with tracking the payment or transaction details, Pabbly Subscriptions also takes care of all the recurring payments and subscription billing process. 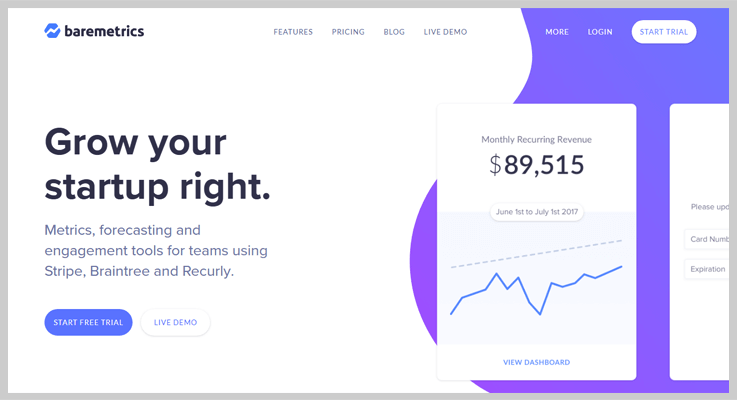 It’s a PCI-Compliance Subscription Management Software with which you can easily sell SaaS-based products and membership. Pabbly Subscriptions provides detailed reports of payment like new subscription, active subscription, net revenue, MRR etc. It supports PayPal & Stripe payment gateway which provides your customer multiple options to make transactions. Pabbly Subscriptions automates all your recurring and one-time payments, so the collection of payments can be a hassle-free task for you. And it also has dunning feature to handle all your failed and denied payments efficiently. The software generates single as well as a list of all invoices for every customer which gives a detailed description of your customer’s bill. With Pabbly Subscriptions, you can also create multiple coupons & discounts on every product for your customers. Starter – Buy this plan at $5/month and get all advanced features like multiple payment gateways, 25+ currency support, multilingual checkout page and a lot more. Rookie– Purchase this plan at a minimal price of $29/month. Plus, you can collect one-time or recurring payments, dunning emails, etc. Pro– Spend $59/month and get access to various features like client portal, multilingual checkout page and a lot more. Advanced– This plan is available at $99/month where you will get various features like client portal, affiliates system, custom domain, etc. 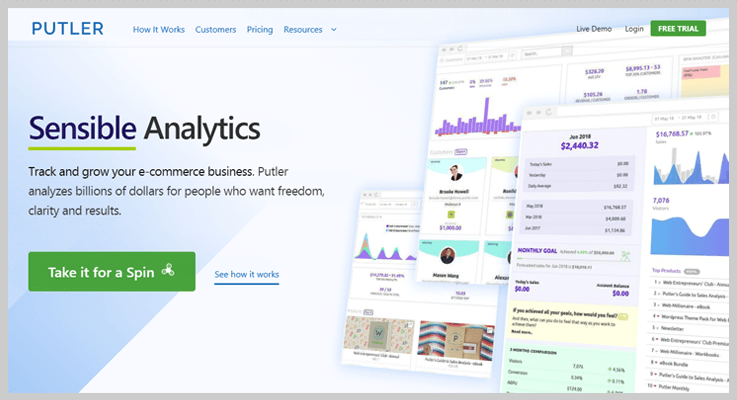 Putler is another popular payment analytic software designed to put you in control of your business. With this subscription analytic tool, you can organize your orders, products, and customer in a systematical form. With Putler, you can import multiple sources of your business data in a single dashboard of your site for eg. payment gateways, shopping carts, marketplaces and Google Analytics. The best thing about Putler is it gives an automatic de-duplication option to eliminate the duplicate copies of repeating data, provides enrichment, currency & time zone conversion. You just need to connect your bank accounts, discover insights and get the things done easily. Putler allows various payment gateway and software integrations like PayPal, Stripe, Braintree, Authorize.net and more. It tracks the details of refunds, search transactions, manages subscription, sends money etc. You can connect it with any other platforms as well with its API keys. It easily monitors 153+ key performance indicators and generates reports. 1. Starter Plan – This starter plan will cost you $29/M and allow you to manage 300 paid orders every month, also you will get 2 years of historical data along with 2 account integrations. 2. Growth Plan – For this plan, you need to pay only $79 per month and get 3,000 paid orders/m, 7 integrations, 5 years historical data along with all common features. 3. Scale Plan – Scale plan will cost you $249/M and provides you 10,000 paid orders/mo, 20 integrations, 7 years historical data, dedicated account manager and so on. Note: Putler provides a free trial of every plan to its customer. Baremetrics is one of the optimal payment analytic tool suitable for all business niche which are offering subscription related products & services. It manages all your manual subscription works through the online and makes you free from every hassle tasks of subscription management. It provides its customers with a merchant account and a payment gateway, along with various features including recurring billing, credit card storage, churn rate, upgrades, cancellations details, email reports and various more. Software supports PCI compliance solution to keep your customer’s credentials safe & secured. It provides Baremetrics forecasting which is a magic crystal ball that helps you predict and plan for the future. You can see the individual stats of all 21 key metrics of your business by simply clicking on your desired option like – MRR values, net revenue, average revenue per user etc. With Braintree, you can create and save groupings of all your customers details in just a second. Understand your health growth by performing simple health checks for other groups of customers. 1. StartUp Plan – This startup plan will cost you $50 per month which allow you to manage up to $10,000 MRR along with historical metrics, segmentation, email reports and various more. 2. Professional Plan – For this plan, you need to pay only $$100 per month which permits you to manage up to $50,000 MRR value rate along with all the bove features. 3. Business Plan – Brainmetrics business plan allows you to manage up to $200,000 MRR at only $250 per month. 4. Enterprise Plan – This plan costs you $500/M for features like forecasting, cohort analysis, etc and gives you the option to manage up to $500,000 MRR. Note: GET 2 MONTHS FREE PAYING ANNUALLY. [That means if you will subscribe to the plan for the early basis and your total billing amount is $5000 then you need to pay only $3000]. 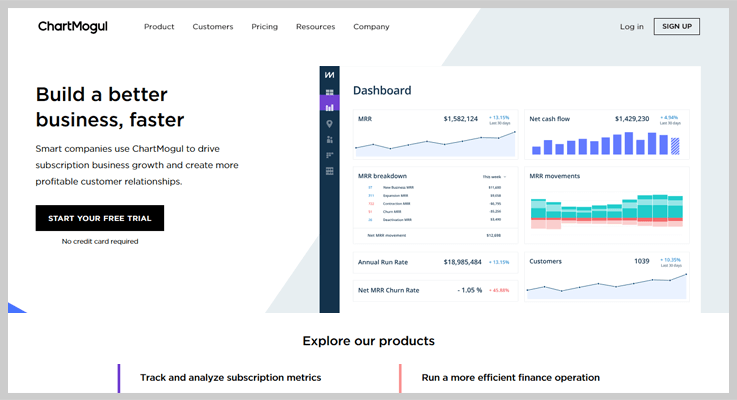 ChartMogul is the SAAS based subscription analytic tool through which you can build a better and faster business to drive subscription business growth and create more profitable customer relationships. It used to track & analyze the subscription metrics, recurring revenue, monthly recurring revenue, subscriber/unsubscriber etc at one place. Get a real-time view into your business performance online and there is no any spreadsheet expertise or technical languages required. It efficiently analyzes all PayPal transactions. It provides a heat map for the clear vision of customer’s details, average sales, churn rate etc. The software contains a cohort value section where you can %age of customers churned relative to the previous month. It automates the revenue management and adds focus to your business. ChartMogul dashboard comes with pre-built filters that make easy to analyze revenues & customers data by bill cycling, plan group etc. 1. Launch Plan – This plan will cost you nothing. That is completely FREE which allows you to manage $10K MRR values including unlimited user accounts etc. 2. Mogul Plan – The price of this plan is $125 a month for per 1,000 paying customers / M.
3. Volume Plan – For this plan, you need to contact the sales team. PaySketch is a recurring billing management tool which is capable to perform real-time analytics and reports of bulk payment transactions, customer details, product details & other important information. The software is PayPal centric that only deals with transaction done via PayPal payment gateway. Each dashboard of PaySketch software embodies the instant search that allows searching for transactions and their status by date, month & yearly ranges. The software gives all the PayPal reporting via filter option, search, view etc. It also allows you to send money through PayPal by simply entering the email address & amount. 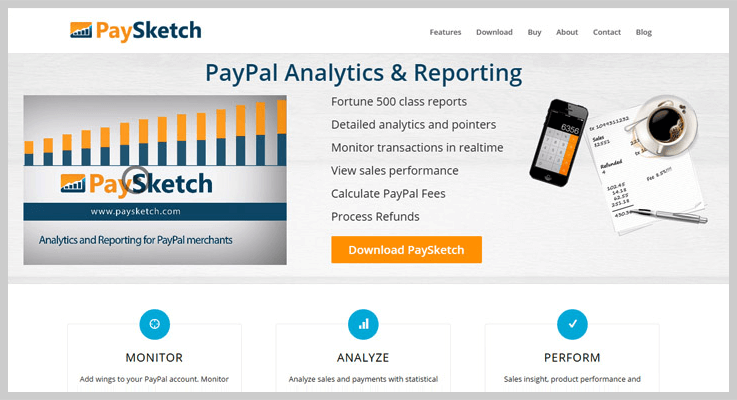 PaySketch gets automatically synchronized. It means when the application is running and connected to the internet, it will automatically download the latest transaction details if happens. In PaySketch you can customization the visible data columns, number of transactions, archive data etc. 1. Standard Plan – This plan will give you a transaction visibility up to 5000 numbers of a transaction, download 1-month transaction history details to the 1 PayPal account at $7.99/M. 2. Business Plan – For this plan, you need to pay $9.99 per month which gives you 20,000 transaction visibility, 3 months transaction history details to the 1 PayPal account. 3. Professional Plan – Just pay $11.99/M and get benefits of 50,000 transaction visibility, 6 months transaction history details with 5 PayPal account. 1. Standard Plan – The subscription of this plan will cost you $59 a year with which you will be getting 5,000 transaction visibility, download 1-year transaction history details etc. 2. Business Plan – At $69/Y, you will get benefits like 20,000 transaction visibility, 3 years of transaction history etc. 3. Professional Plan – This plan has got a price tag of $79 for a year which gives 50,000 transactions visibility, you can also add 5 different PayPal accounts for payment analytics and a lot more. 1. Standard Plan – At the price $99 for a lifetime, you are given to access 5,000 transaction visibility every month & 1 PayPal account to connect. 2. Business Plan – For the business plan you have to pay $125 for a lifetime and after that, you will get 20,000 transaction visibility along with the option to connect 1 PayPal account. 3. Professional Plan – $150 will be charged for this lifetime plan. You will get transaction visibility up to 50,000 transactions every month and you can connect 5 PayPal accounts for analytics data. Control is a real-time analytics software with which you get all transaction details and payment alerts from various sources like PayPal, Stripe, Square and various more. The software allows you to make beneficial decisions and increase the revenue of your business. It has a map feature which controls payment analytics software that allows you to locate revenue, decline payment details etc. The software delivers alert news for new sales if new customers arrived, default payment and more instantly. Control has also got iOS and Android apps which is one of the advanced features of this payment analytics software. 1. Starter Plan – In this plan, you need to pay only $0 as it is completely free. It provides you the access of 6-month data history, 2 custom filters, email supports etc. 2. Growth Plan – The price of this plan is $75 for a month and you will get up to 5 connected devices, 2 years of data history status, 5 custom filters etc. 3. Scale Plan – Cost of this plan is $130 monthly and you will get unlimited connected devices, 5-year data history, unlimited custom Filters, live chat and more. So, these are the best Payment Analytic Tools which helps you to do advanced analysis of your business. Subscription management is a complex process but after analyzing these software I can say that the tools can ease some of the pressure and discover new approach for your sales team. Share your experience with us by dropping a comment in a comment section below.